LONDON (Reuters) - Britain's competition regulator has dealt a potentially fatal blow to Sainsbury's planned $9.5 billion (£7.3 billion) takeover of Walmart's Asda, saying the supermarket groups are unlikely to be able to address its "extensive" concerns about the deal. Shares in Sainsbury's plunged as much as 17 percent on Wednesday after the Competition and Markets Authority (CMA) said its provisional view was the deal should be blocked, require the sale of a large number of stores, or even one of the brands. "Close to the worst possible outcome (for the companies)," said Bernstein analyst Bruno Monteyne. Sainsbury's, Britain's second-biggest supermarket chain, and number three Asda agreed the deal last April, aiming to overtake market leader Tesco. They hoped their combined buying power would enable them to better compete with fast-growing discounters Aldi and Lidl, an enlarged Tesco after its purchase of wholesaler Booker and online retailers like Amazon. If approved, the deal would create a company with annual revenue of about $66 billion, more than 2,800 stores and a grocery market share of 31.2 percent. It would also give the world's biggest retailer Walmart a way to exit Britain, one of the weakest performers in its portfolio. The biggest proposed takeover in the UK sector for 15 years, the two groups have pitched it as a way to cut prices for customers in a £185 billion-a-year market. But the CMA said it had "extensive" concerns that the deal could lead to higher prices, a poorer shopping experience and reductions in the range and quality of products offered. It was "likely to be difficult for the companies to address" those concerns, it said, adding it was also worried prices could rise at a large number of Sainsbury's and Asda petrol stations. The two companies issued an immediate and angry response, saying they fundamentally disagreed with the findings. Sainsbury's boss Mike Coupe, who as the architect of the deal could come under investor pressure if it fails, added: "We will fight right the way through the process". At 1250 GMT, Sainsbury's shares were down 15.4 percent at 243.7 pence. Smaller rival Morrisons, which could benefit from two of its rivals being distracted by a major integration and the exit of Walmart, fell 6 percent. Tesco's shares were little changed. The CMA, an independent body which works to promote competition for consumers, will now seek responses and submissions from all interested parties ahead of a final report due by April 30. It has been led since last June by former lawmaker Andrew Tyrie, who was unafraid to take on the big banks when he chaired the parliamentary committee overseeing financial services. "It's our responsibility to carry out a thorough assessment of the deal to make sure that the sector remains competitive and shoppers don't lose out," the CMA's Stuart McIntosh said. It said the presence in any geographical location of the big four supermarkets of Tesco, Sainsbury's, Asda and Morrisons prevented the others from raising prices. While discounters Aldi and Lidl do apply their own pressure, they do not do so to the same extent because they offer a smaller range. 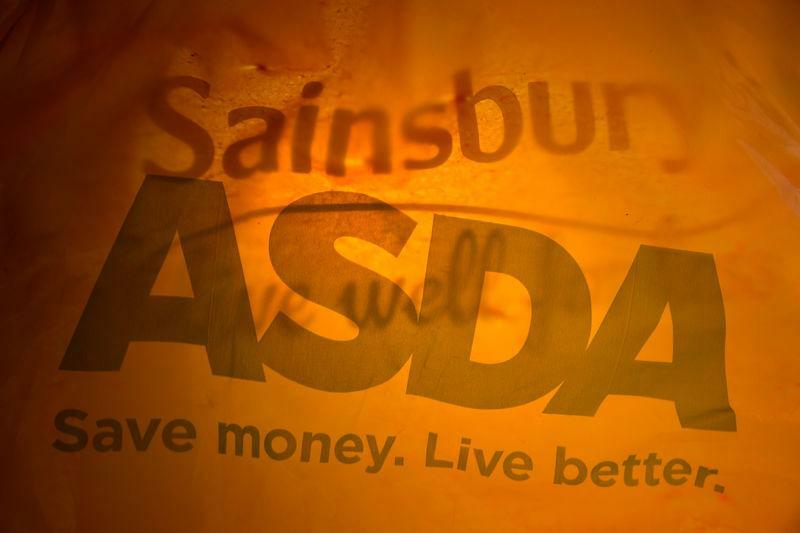 As a result, the CMA said were Sainsbury's and Asda to merge, the combined group could push prices higher because there would be less competition in the market. Sainsbury's and Asda accused the CMA of not understanding market forces. The unexpectedly harsh verdict meant investors turned their focus to the standalone futures of the two groups. Sainsbury's has underperformed the wider sector in recent years, while Asda has steadily improved. "For Sainsbury's we see this as a major blow and one that removes the merger premium and so we downgrade to SELL, noting its laggard status in British supermarketing," Shore Capital said. Bernstein's Monteyne said there were now enough worries at Sainsbury's "to make the shares nearly uninvestable in the next few months". Jefferies analysts said Asda could be bought by a private equity group. The CMA's objections contrast with the relatively easy passage given to Tesco's takeover of Britain's biggest wholesaler Booker, which rivals and some analysts had argued would give Tesco an almost unassailable position in UK retail. "The CMA has moved the goalposts and its analysis is inconsistent with comparable cases," Sainsbury's and Asda said. "We will be working to understand the rationale behind these findings and will continue to make our case in the coming weeks." Asked if Sainsbury's would consider a judicial challenge, CEO Coupe said the group would fight on. Under the takeover plan, Walmart would receive £3 billion and take a 42 percent stake in the combined business. Walmart has the option of selling down to 29.9 percent after two years and exiting completely after four. The two groups have said they would lower prices on "everyday items" by around 10 percent, financed by cost savings from big suppliers. Both companies have declined to say how many forced store disposals would make the deal unattractive, but a source with knowledge of the two firms' thinking has told Reuters a figure "into the hundreds" could scupper it.